Antonio Vivaldi (1678-1741) composed Violin Concerto No. 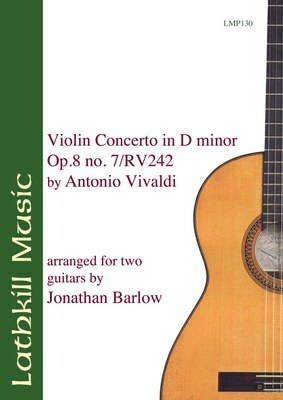 7 in D Minor, RV 242, as the seventh of twelve violin concertos originally published under the title Il cimento dell'armonia e dell'inventione (The Trial Between Harmony and Invention), Op. 8. The first four of this collection are Le quattro stagioni (The Four Seasons) which are among Vivialdi's best-loved works. Although less performed than The Four Seasons, the concerto presented in this edition is a consummate example of Baroque concerto with finely crafted melodic content, lovely sequences, and energizing rhythmic figures.